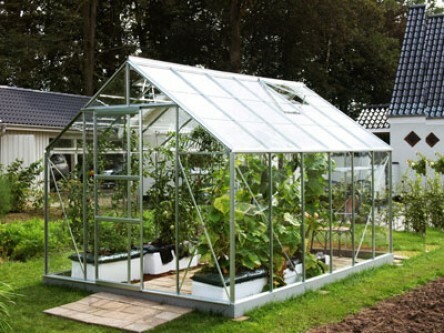 – a quality greenhouse, 2.57m (8’5”) wide with a single, sliding door with a simple lever mechanism to hold it in any desired position. Corner plates at both eaves and ridge, together with roof and side braces, give this building improved strength. Available in 4 sizes and with higher eaves (1.35m/4’5”) than usually associated with this type of greenhouse, the Neptune (Merkur) also has the Vitavia standard gutter. All Neptune (Merkur) models have been approved by the TÜV Standards Authority.